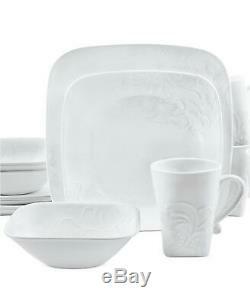 Corelle Boutique Cherish Embossed 16-Piece Square Dinnerware Set for 4. Graceful florals bloom in the pure white ground of Corelle's Cherish dinnerware, giving beautiful texture to contemporary shapes. Chip-resistant durability adds to its effortless style. 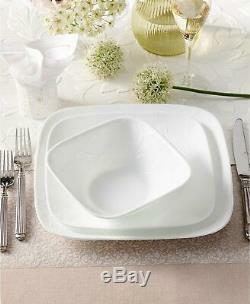 Plates/bowls are oven-safe in pre-heated convection up to 350 degrees. 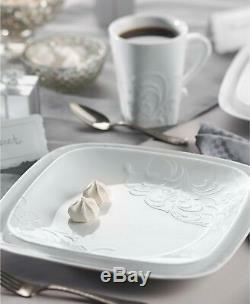 Includes 4 of each of the following: 10.75" dinner plates, 8.5" salad plates, 18-oz. Made in USA and Imported. Dishwasher, refrigerator, microwave & pre-heated oven safe. Patterns wont wash, wear or scratch off. Mugs are made of a durable stoneware material. Vitrelle® glass is lightweight, stackable & break and chip resistant. Vitrelle® glass is proudly made in the USA. US (lower 48 states) -no PO / FPO boxes. ALL ITEMS ARE IN STOCK WHEN WE LIST THEM. The cups are made in China. 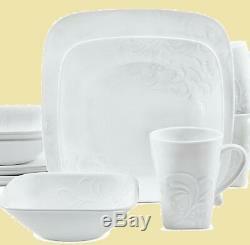 The item "Corelle Boutique Cherish Embossed 16-Piece Square Dinnerware Set for 4 NEW" is in sale since Tuesday, September 4, 2018.